We are committed to raising healthy animals and fruit and continuing active farming in our community. This land has been farmed a long time -- since the 1780's. 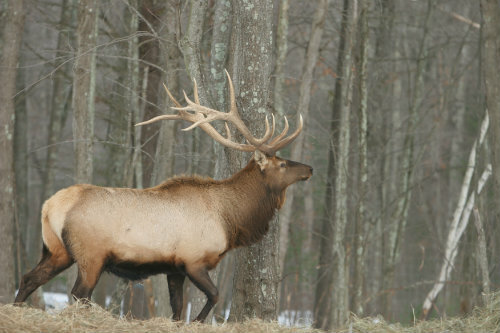 We brought elk to the farm in early 2000, and the herd continues to thrive each year in a natural, free-range environment. We have a variety of fruit trees but specialize in asian pears. The land is protected by conservation and agricultural easements to retain open space and promote sustainable agriculture in Lee. Our "velvet pastures" provide all of the grass and hay for our animals year round. Elk meat is available in familiar cuts such as steaks, loins, medallions, burgers, sausages, and roasts. Our elk has a rich, slightly sweet flavor and never has a wild game taste. All our elk meat is USDA inspected. Asian pears are large, round, crisp and crunchy, and very sweet! They store well and make great snacks. We typically have pears available from fall into early winter. We also offer pasture-raised Cornish Roaster chicken. We raise our birds in a "Joel Salatin-like" chicken tractor so they get sunshine and fresh grass and insects daily as well as grain. This year we are continuing to grow hardy kiwi berry up on the hill. Those will hopefully produce in a year or so. This year, however, we hope to have rainbow trout raised in our pond for sale in late fall. At farm (call ahead). We're happy to sell from the farm, and if we're here, we're open. Do call ahead, however, to make sure someone will be available (603.659.6972). Giving a day or so notice really helps!